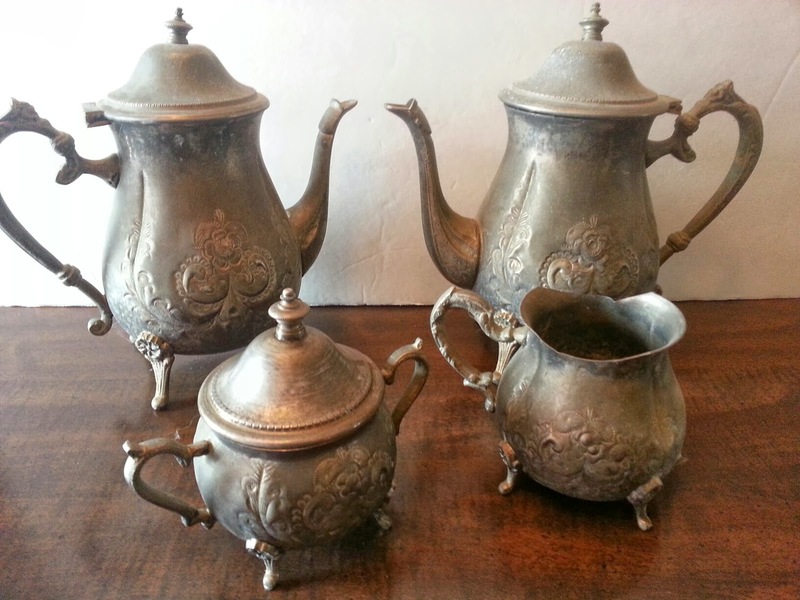 Many years ago we made a trip to Casablanca and purchased this lovely Tea set. Over the years it has become extremely tarnished while in storage. I cringed when we brought it out a couple weeks ago. I was almost ready to put it away and save the work for another time. I then thought why not search for a recipe for homemade silver tarnish remover. I found several recipes online and tried a few. They all seemed to work a little but since the set has been tarnished for so long the tarnish was not going to disappear without a fight. I then thought why not combine all the recipes together and see what might happen. So, this is the recipe I finally used. Mix ingredients carefully as the vinegar and soda will foam up over the bowl if it is not deep enough. Also take care not to be burned by the boiling water. Dip the tarnished silver into the mixture. I waited a while letting it soak a bit. If your silver is precious you should probably purchase an actual silver cleaner. Or better yet have a jeweler clean your silver for you. Any way I decided to give this a try. After removing from the mixture I rubbed the pieces with a soft cloth. I then used a little toothpaste to finish the polishing. The paste I used was plain white without baking soda or whiteners. I still have some work ahead of me. But I think they are looking much better. Oh, if you decide to use tooth paste of which I do not recommend be careful not to scratch your pieces. That is pretty neat that you can make this at home - and probably save a small fortune on expensive store-bought remover. That really works. I had heard vinegar worked but never tried it. Do you know what I used to do. I would put some old lipstick I had laying around on a cloth and rub it in and then off. Makes it shine. Wow, this is great results! I am so sending this to my mother, she has been trying to get my granny's silver clean! It's amazing! I'll have to try these ingredient. I used toothpaste to clean my cosmetics jewelry before. It did an amazing job! Great results! I'm going to share this with my dad. He loves to buy old silver on eBay so something like this would be great for him. Those really look awesome! What a difference that makes. Tarnished or not, I want that set! I make my own silver cleaner using this same recipe - been using it for years and love it. I would have never thought of making it at home. That's very helpful to know. I did something similar one time, only without the aluminum foil - I wonder if that's why I had to work so hard buffing it. I'll try the foil next time! That's an amazing set! Thank you for sharing the recipe for cleaning. Looks like they are cleaning up nicely. I have never made my own. Looks like it's cleaning up well! I don't own any silver but I love it when people use homemade products to solve problems. Your tea set is lovely. 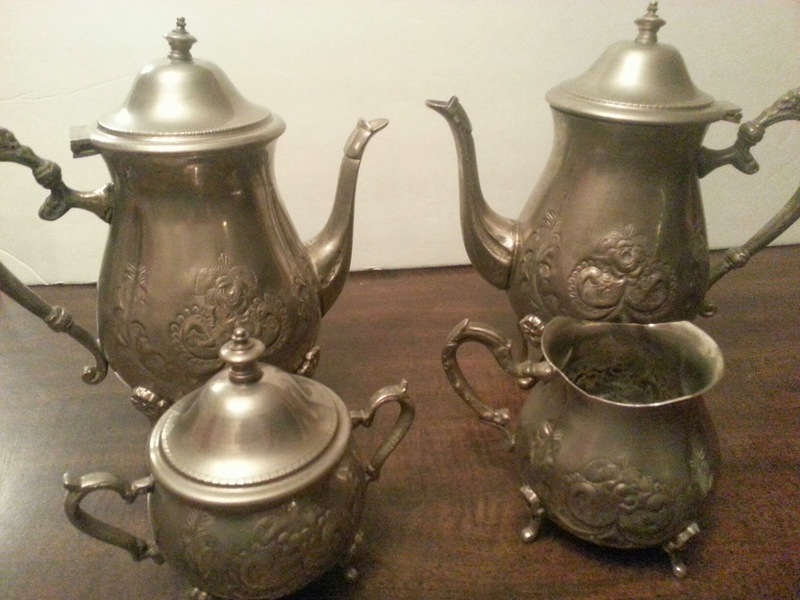 I dont have any old silver but am thinking of antiquing... I think I'll bookmark this page in case i need this for later! Thanks! I own silverwear but it's all second hand from friends lol So hoping some day I could get some nice silver things that I want to keep polished. I do have baking pans ect but no tea set I don't even own a tea pot lol we just are starting out. Thanks for reminding me I need a tea set. what a gorgeous tea set! And love that you didn't have to use any harsh chemicals to make them shine again! This is impressive... I have not seen handmade tarnish before. The finish looks very antique. They do look so much better that when you took your first picture. I can't wear silver because of allergies but I have a friend who wears nothing else. I will be passing along your recipe. It will surely save her some money.